Aboard Viking’s new ocean cruise ship, guests can drink aquavit in an infinity pool and reinvigorate in a Nordic snow room. The big ocean cruise lines often introduce new ships and ports, but it’s unusual these days for an entirely new player to enter the game. That’s why it’s exciting that Viking, after nearly two decades of operating small luxury river cruises, is introducing its first ocean-going vessel this month. 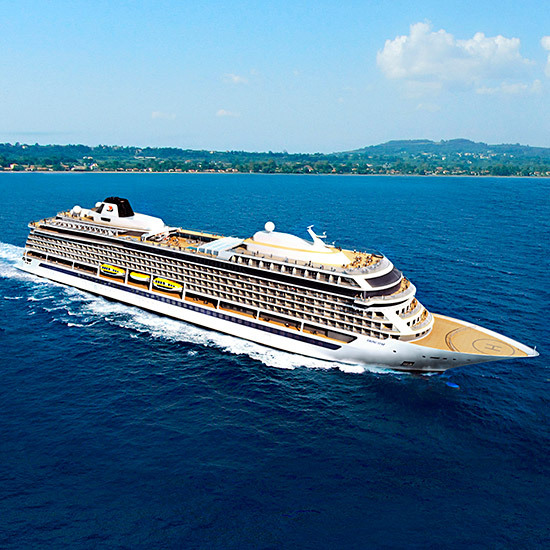 Even more exciting (especially for a modern design nerd like me) is the look of their new ship, the Viking Star, which has Scandinavian-inspired interiors by Rottet Studio, a firm best known for working on high-end hotels like The Langham in Chicago. Nearly five times the size of the ships in Viking’s river fleet, the 930-passenger Star is filled with Nordic touches, from the spa’s snow room–and–sauna combination to a menu offering a traditional dilled fish soup named after Bergen, Norway (Viking is one of only a handful of lines that stop in the picturesque northern city). In addition to food-centric offshore excursions—on the Istanbul-to-Stockholm itinerary, these include a visit to mussel and oyster beds in Croatia and a “fjord safari” to a Norwegian goat-cheese farm—guests will have plenty of culinary options while at sea. Central to the new ship’s design is a teaching kitchen where students can brush up on their knife skills while preparing dinner with fellow passengers under the guidance of one of the chefs. The space looks like it came straight out of my favorite Scandi style blog. vikingcruises.com.